As great as your construction site safety program is, workplace injuries can still occur. If an injury does occur on your jobsite, wouldn’t it give your team peace of mind knowing that an onsite medical provider can provide care to the injured worker immediately? Our team of medically-trained professionals can document the injury, maintain control of the injury, and get your worker back to work! Our Med Tech division is with you on site to assess workplace injuries and guarantee an effective return to work program for injured workers. Our team is medically trained to treat workplace injuries and ensure a fast return to work time, saving sites money by saving time. Our team of medically-trained professionals follow OSHA guidelines and regulations, keeping your workers on site safe and your site in compliance. TSC provides Med Tech services to NYC construction sites. Our TSC Onsite Med Tech division consists of trained medical providers who can treat minor injuries, stabilize the more significant injuries, provide attentive follow-ups to ensure workers have only minimal lost days if the injury is significant enough to warrant time away from work. 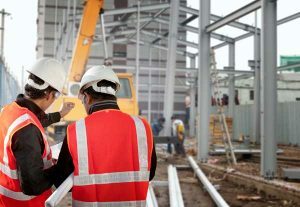 Our TSC Onsite Med Tech team works closely with your construction team and risk management team to provide real time injury reporting and worker follow up status reports. TSC’s Onsite Med Tech team can help reduce your workers compensation claims and OSHA recorded incident rates by providing effective and efficient onsite medical care. Our Med Tech providers can also aid your team in identifying using our experience potentially fraudulent injury claims and aid in your construction sites required compliance with OSHA standards. 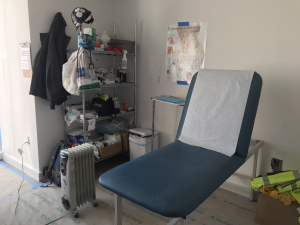 Our TSC Onsite Med Tech team is trained in construction safety including OSHA 10, OSHA 30, NYC DOB scaffold and DOT flagger training certificates. Several providers hold the S-56 Certificate of Fitness FDNY. Assessing, effectively managing, and treating most on-site emergencies and illnesses, possibly preventing the lost time injury that impacts your workers compensation costs. Completing the post incident administrative documentation and report these incidents. Communicating with injured workers for an injury follow up program. Implementing an effective return to work program that meets the needs of your field team as well as your risk management teams program requirements. Utilizing numerous accepted industry reporting forms such as the OSHA 300 log, First Report of Injury form and the NYS C-2F. Providing analyses of injury reports to identify injury trends and maintain comprehensive record-keeping of all safety and health issues on-site. Assisting your onsite project and safety team in identifying safety concerns. Assisting in keeping your jobsite healthy and safe. Our TSC MedTech team can develop and implement a comprehensive Drug-Free and Alcohol-Free Work Plan on your site. Our TSC Onsite MedTech team can offer guidance to your team on emergency evacuation procedures and coordinate all emergency services in the event of a sitewide emergency. Talk to an Onsite Med Tech Expert Today! Talk to a Safety Professional Today! Have trained medical staff on your site today! Contact a safety expert from Total Safety Consulting.